The McDonnell Douglas F/A-18 Hornet is a twin-engine carrier-based attack fighter derived from the YF-17 Cobra attempt at a new USAF lightweight fighter, on which the USN was a minor partner (the F-17 lost out to the YF-16). The Navy preferred the YF-17 over the winning F-16 Fighting Falcon, because of its twin-engine design. For the Navy version, Northrop teamed with McDonnell Douglas and when the two services ended up choosing different aircraft, McDonnell Douglas became the primary contractor for the Navy design (McDonnell Douglas merged with Boeing in 1997). The Navy's design concept originated from Vice Admiral Kent Lee. An experienced naval aviator in WWII, he and his supporters pushed for a cheap and lightweight strike fighter, to complement the F-14 Tomcat which had become operational and was just being introduced to the carrier air wings in 1973. The F/A-18 has a digital fly-by-wire flight control system, the cockpit equipped with three multi function displays. The entire avionics suite is digital. The F-18 is powered by two 71 2kN General Electric F404 reheated turbofans, and equip-ment includes a Hughes APG-65 radar with air-to-air and air-to-surface modes giving intercept and attack capabilities, a Ferranti/Bendix headup display, Kaiser multifunction displays, and Litton INS. Other externally carried sensors include laser tracker and Flir pods. As a carrier-capable platform, the F/A-18 maintains folding wings. The Hornet is capable of air-to-air refuelling. 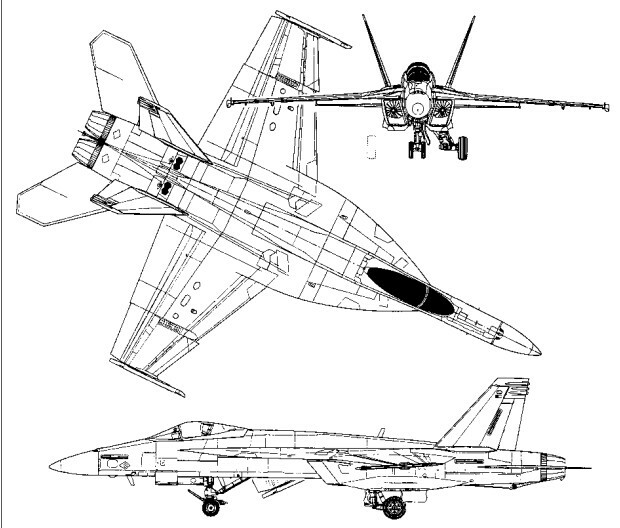 The first of 11 full-scale development (FSD) Hornets flew on November 18, 1978, and was followed by the first production aircraft in April 1980. F/A-18 Hornets (A and B variants) entered service in 1983, replacing the F-4 Phantom II and the A-7 Corsair II. F/A-18A/B were single and two seat aircraft. The F-18B two-seat trainer retains full operational capability with only a six per cent reduction in internal fuel capacity. 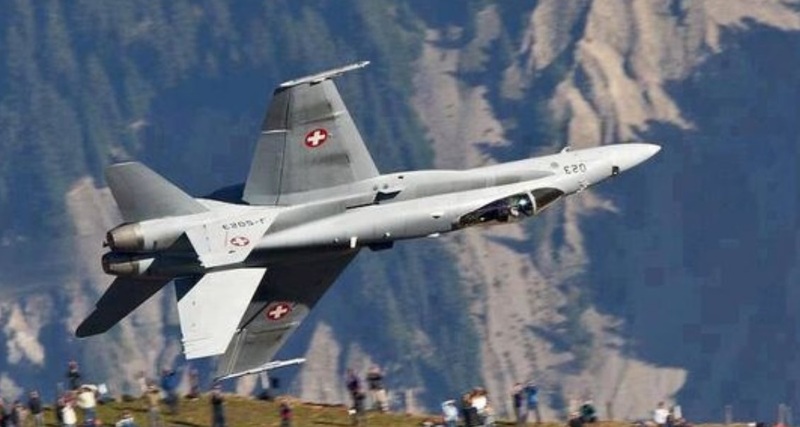 FY1986 and subsequent purchases are of the upgraded F-18C/D variants, which have AIM-120 Amraam and infrared Maverick compatibility, airborne self-protection jammers, Naces ejec-tion seats, and improved computers. 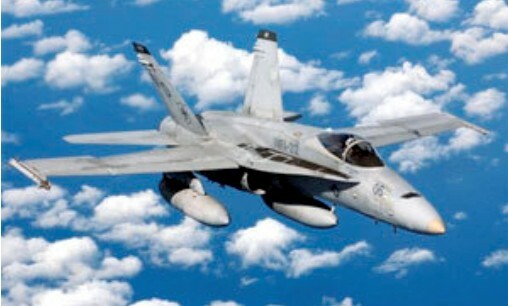 The first F-18C flight occurred in mid-1986. 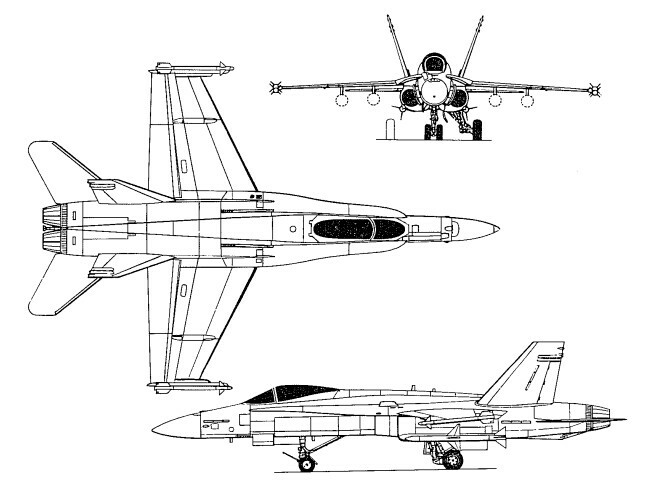 After a production run of 371 F/A-18As, manufacture shifted to the F/A-18C/D single and two seat variants in September 1987. Seventy-seven F-18A single-seaters and eight F-18B two-seaters delivered during 1986, including 24 for the USMC. MDC handed over the 500th F-18 Hornet, an A model for the USMC, in May 1987. Although the single seat variants, A and C, were first equipped with the AN/APG-65 radar, since 1994 all US Hornets feature the improved AN/APG-73 radar. The second seat of the B and D models is often manned by a weapon system operator or instructor. Test-ing of a reconnaissance version, the US Navy F-18(R) continued. The nose-mounted 20mm rotary cannon was replaced by a sensor pallet with panoramic camera and infrared linscan. The aircraft can be reconfigured overnight for strike missions. Licence-assembly of Hornets continued in Australia in 1987, where GAF has delivered more than 20 to the Royal Australian Air Force. The CF-18 is the designation used for the Canadian licensed built aircraft. The Canadian Armed Forces purchased 138 examples of the CF-18 including 24 CF-18B two-seaters. The first prototype F/A-18E Super Hornet flew on November 29, 1995. The F/A-18E/F "Super Hornet" arrived in 2002 and represented an aircraft that was 20 percent larger and more powerful than the base Hornets. The Super Hornet is produced by a consortium of contractors that includes Boeing and Northrop Grumman. The tandem-seat Super Hornet was designed to be ultra-capable in both strike and interceptor roles and squadrons are already operating on various USN carrier battle groups. The Super Hornet is built on the F414-GE-400 series of powerplants, which stands as a highly advanced modified version of the original F404 turbofans, bigger air intakes, and the airframe itself is longer. A 33% larger internal fuel capacity and larger ordnance carrying capacity improves the range significantly. As a whole, the Super Hornets, despite their advanced infrastructure, is compiled of less parts than the original Hornets making the Super Hornet that much easier to maintain. Additional hardpoints make the Super Hornet a viable replacement to the F-14 Tomcat and A-6 Intruders. The F/A-18E (single seat) and F/A-18F (two seat) Super Hornets provides increased range and improved combat mission endurance. The Super Hornet also makes use of an increased payload. F/A-18F Super Hornets with a WSO in the rear seat are replacing the F-14 Tomcat. The US Navy took delivery of its first Super Hornet in 1999. Super Hornets are larger than the original models with many detail improvements. Their increased wing area allows them to carry more stores further on their extra hardpoints. They are most easily recognised by their rectangular engine air intakes. The Royal Australian Air Force was to obtain 24 Boeing F/A-18F Super Hornets by 2010, until the full introduction into service of the F-35 Lightning Joint Strike Fighter. Twenty-four F/A-18F Super Hornets were to replace the F-111s at Nos 1 and 6 Squadrons at RAAF Base Amberley from 2010. Boeing modified an F/A-18 Super Hornet as the EA-18 airborne electronic attack (concept) aircraft, carrying three ALQ-99 jamming pods. The EF-18 designation is also used for Spanish F/A-18A/B Hornets (EF-18A and EF-18B) where the E stands for Espanga. The RF-18 which is a dedicated reconnaissance version. The Boeing EA-18G Growler electronic warfare variant, to replace the EA-6B Prowler, differs from the F/A-18F in several areas. It is wired in production differently with additional wiring and databuses from the wing stations and various fuselage antennae points. The nose gun is replaced with additional avionics for jamming missions, and carries two ALQ-218 tactical jamming receivers pods on the wingtips, and between one and five AN/ALQ-99 jammers on centreline and wing stations. There remains two wing and two should stations. It is also equipped with the APG-79 AESA radar. 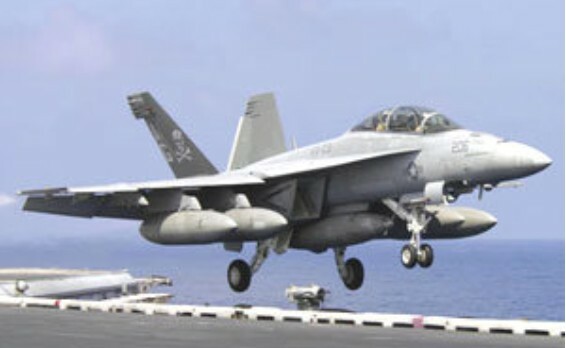 The F/A-18 first saw combat action in 1986, when Hornets from the USS Coral Sea (CV-43) flew SEAD missions against Libyan air defenses during the attack on Benghazi. Ten F/A-18’s were lost in the Gulf War, most to surface to air missiles although one was alleged to have been shot down by an Iraqi MiG-25PD in the first hours of the air campaign. F/A-18’s were credited with two kills, both of MiG-21’s, during that conflict. Operators: US Navy, US Marine Corps, Australia, Canada, Finland, Kuwait, Malaysia, Spain, Switzerland. Engine: 2 x General Electric F404-GE-402 turbofans, 78.73 kN (17,700 lb st) with afterburning. Engines: 2 x General Electric F414-GE-400 turbofan, 9,800kg. 22,000lbs thrust with afterburner.